The Orange County Veterans Advisory Council and Mayor Teresa Jacobs recently gathered to celebrate the birthday of retired Air Force Col. Hugh Durwood Maxwell Jr., who turned 100 in May. 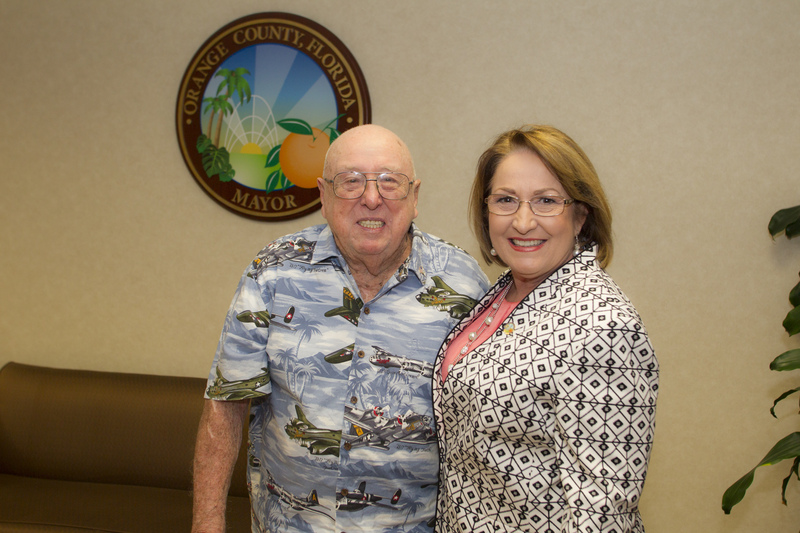 At the celebration, Mayor Jacobs proclaimed his birthday, May 22, as Col. Hugh Durwood Maxwell, Jr. Day in Orange County and commended him on his many years of service to the nation and Central Florida. Col. Maxwell was born on May 22, 1916, in North Carolina. He entered high school at the age of 12 and enrolled at University of North Carolina at the age of 16 to study journalism. After college, he worked for a local newspaper until 1939 when he learned about opportunities with the U.S. Army’s Flying Cadet Pilot Training Program. Within two years, he received his first set of orders at the former Orlando Army Air Base, which is now the Orlando Executive Airport. Following the attack on Pearl Harbor, Col. Maxwell flew a B-25 Mitchell Bomber to Long Island, New York, and started anti-submarine patrols over the North Atlantic. He later took over a four-engine B-24 Liberator, reporting to Port Lyautey, a former U.S. Naval Air Station in Morocco, where he and his crew flew convoy escorts and performed anti-submarine patrols. When he returned to the states, Col. Maxwell became an instructor on the new B-29 Super Fortress. After the war, he stayed in the Air Force as an intelligence officer and served three tours of duty in the Pentagon, alternating with tours in Newfoundland, Canada, Tokyo, Japan and St. Louis, Missouri. Col. Maxwell retired in 1969 to his original duty station in Orlando and remained active in community affairs and volunteer work for many years. Orange County supports local veterans through Mayor Jacobs’ Veterans Advisory Council, which is comprised of more than 30 veterans and community leaders who work to provide recommendations and services that enhance the quality of life for local veterans and their families. Orange County’s Veterans Services Office also provides support for veterans, dependents and survivors to ensure they receive all the benefits they have earned, including medical care, vocational training, compensation for service-related injury and illness, referrals and financial assistance. Mayor Jacobs and the Veterans Advisory Council invite citizens to the War Memorial Wreath Presentation and Commemoration Ceremony at 10 a.m. on May 30. Held annually at the Orange County Courthouse, the ceremony honors the nation’s fallen Sailors, Soldiers, Airmen, Marines, and Coast Guardsmen and will feature retired Army Lt. Gen. Jack Stultz Jr. as the keynote speaker. To RSVP, click here. To view photos from the celebration, visit Mayor Jacobs’ Flickr album.